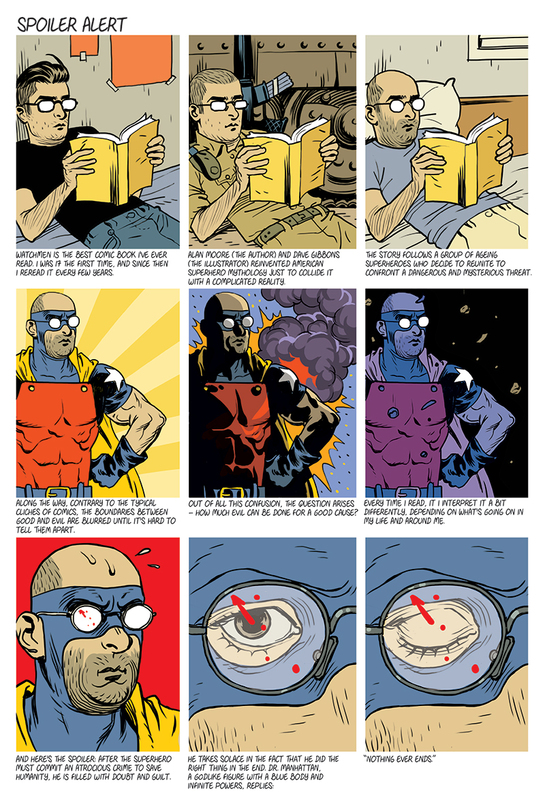 The most recent installment in the Realist comic blog by Asaf Hanuka, the illustrator for the cover and splash pages of Moving Images, offers some great lessons in the range of competencies inherent in media literacy and the expressive potential of visual communication. In a nine-panel, single page comic, Hanuka, an Israeli native, takes on one of the most challenging, complex, and controversial topics from the news of this past summer: the conflict between Israel and Gaza. Without ever saying so directly. From its title, “Spoiler Alert” – which uses the meaning of this phrase as a warning from a critic or other commentator regarding a reveal of the content of a media creation – to the references to a graphic novel (later made into a movie) to the precise use of visual information married to text, the reader must engage in media literate interpretation in order to process this work. Since the artist puts the reclining figure of the narrator in the same position reading the same book in the first three panels, we instantly know that this is the same person seen over a sequence of years, much like in the examples described in Chapter 1 of Moving Images. Then, the visually literate reader can also move to more subtle and detailed visual information conveyed to us by the artist: in movie terms, the art direction of the backgrounds (from a student’s room to an army scene to an adult’s comfortable bedroom with framed picture), the costume changes, and finally the cinematography of the lighting and lens changes in the second and third trios of images. In fact, in the final three panels Hanuka creates the graphic novel equivalent of camera movement or a push in with the concluding images of this comic. They underline and heighten the drama much like a comparative movement in filmmaking. 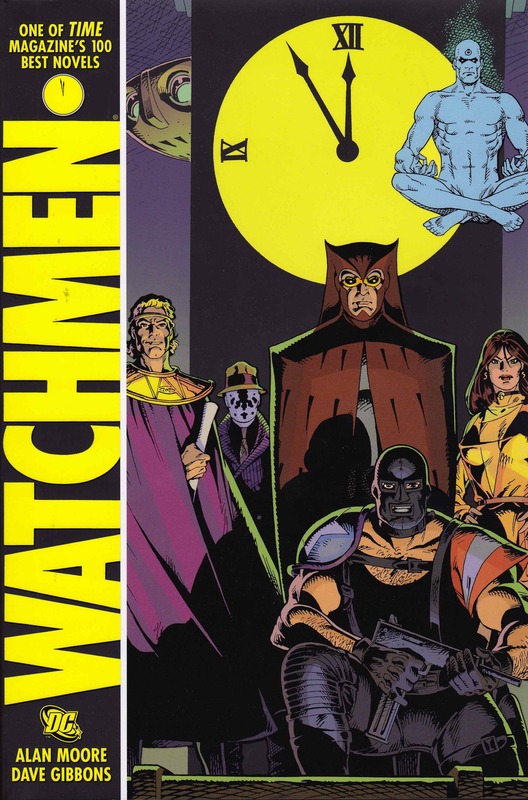 All of these values serve the story and messages of this creation made up of words and pictures, which uses the narrator’s understanding and interpretation of the themes of the groundbreaking graphic novel Watchmen by writer Alan Moore and artist Dave Gibbons as they shift and mature over his lifetime to express powerfully the moral dilemmas he sees in the world around him. It is not a ridiculous leap to see it as a discussion of the current conflict between Israelis and Palestinians, particularly when one considers the context of The Realist blog which has dealt with related issues in a number of its preceding entries – while through its lack of specifically referring to these events it also calls to mind similarly thorny dilemmas in history and the contemporary world. This example features a topic that is challenging for any educator to address because of its highly emotional and incendiary subject matter, but it points to the value of precise use of visual communication and the demonstrative impact of image-based media, whether through the sequential art of graphic novels or sequences of shots that make up moving images.